This Fleet Locations page lets you manage your vehicle pickup and return locations for when you have several pickup and drop-off points. By default, the system creates 2 points which are office and airport. How to add a new location? Firstly, click the blue “Add Location” button located on the top right of the page, highlighted in orange in the picture below. Once you click on the button, a new page will appear. Fill in all the necessary details of the location you are adding in. You can click on the blue “Add new open hour block” button, highlighted in orange in the picture below if you would like to add the opening hours of the location. The open hour block will look something like this. Here is where you can set the opening hours of your particular location. You can click on the blue “Delete” button, highlighted in orange in the picture below to delete the opening hour block. There are 5 additional charges setting that you can add to the specific location. These can be set up in the section highlighted in orange in the picture below. The 5 settings are Mandatory Additional Charges, Mandatory Additional Charges for Pickups Only, Mandatory Additional Charges for Outside Hours on Pickup, Mandatory Additional Charges for Returns Only, and Mandatory Additional Charges for Outside Hours on Returns. This will set the additional charges that will be mandatory when the customer selects the location for pickup or return. This will set the additional charges that will be mandatory when the customer selects the location for pickup. This will set the additional charges that will be mandatory when the customer selects the location for pickup and the reservation is out of the opening hours of the location. This will set the additional charges that will be mandatory when the customer selects the location for return. This will set the additional charges that will be mandatory when the customer selects the location for return and the reservation is out of the opening hours of the location. Once you are done making changes to the location, click on the blue “Save” button, highlighted in orange in the picture below to save the changes. 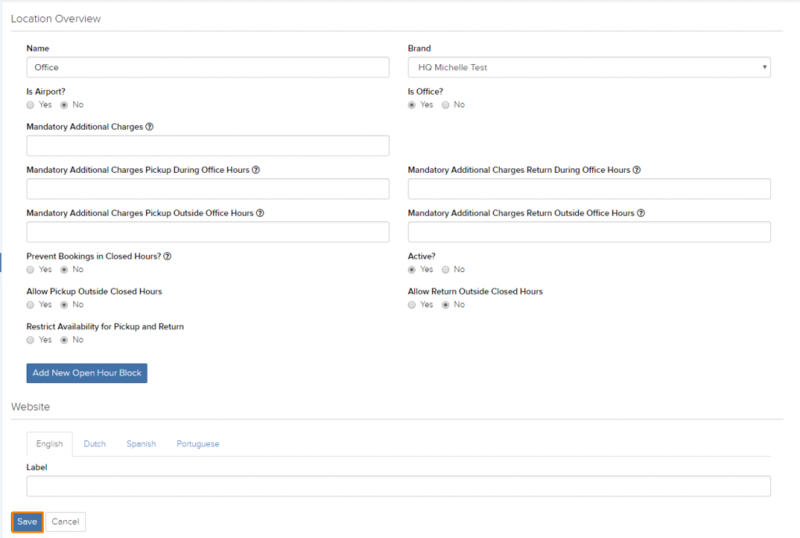 How to prevent bookings, pickup, and returns outside office hours? 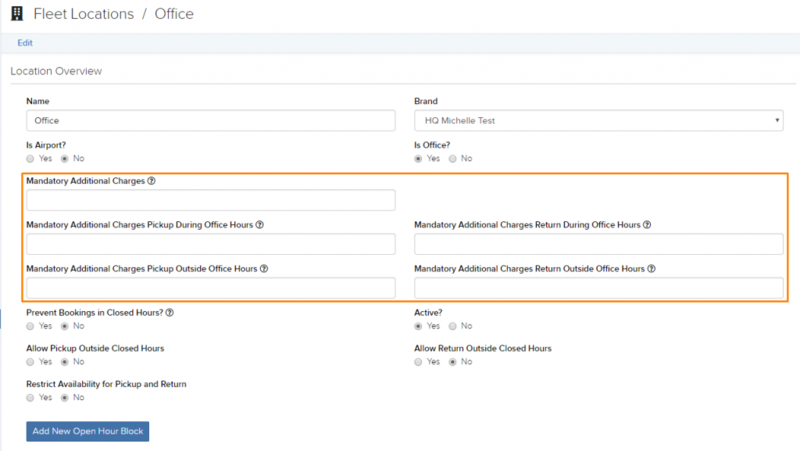 To prevent bookings outside of office hours you would first need to create/set the open hour block. After you have done that, select “Yes” under “Prevent Bookings in Closed Hours?” as shown in the picture below highlighted in orange. To prevent pickups being made outside of office hours you would first need to create/set the open hour block. After you have done that, select “No” under “Allow Pickup Outside Closed Hours” as shown in the picture below highlighted in orange. 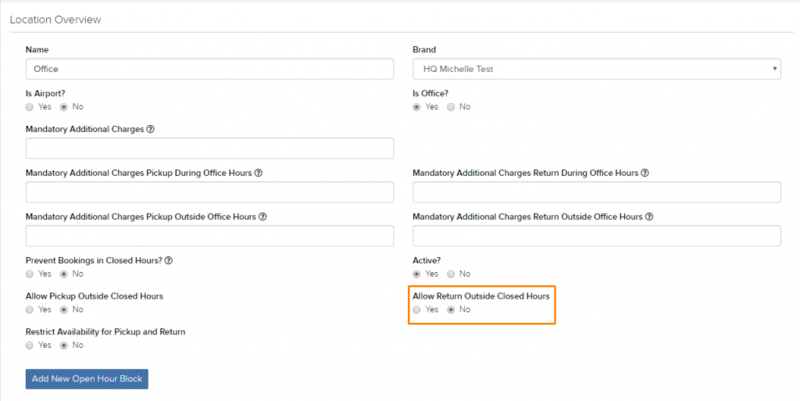 To prevent returns outside of office hours you would first need to create/set the open hour block. After you have done that, select “No” under “Allow Returns Outside Closed Hours” as shown in the picture below highlighted in orange. Firstly, click on the location that you would like to delete. Next, click on the red “Delete” button located on the top right of the screen, highlighted in orange in the picture below.